This past weekend, Nascar newbie Juan Pablo Montoya shed his F1 skin for good, as he aided Chip Ganassi Racing (also starring Felix Sabates) in securing the team's second Rolex 24 at Daytona victory in as many years. He did it on his first try — just as he'd done with the Indy 500 in 2000 — a likely confidence booster for the former F1 rogue, who's heading toward his first full Nascar season after a rocky start during 2006. 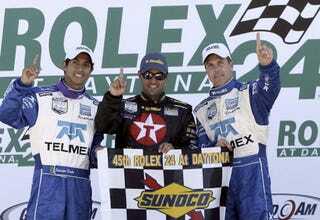 With co-drivers Scott Pruett and Salvador Duran, the team led 468 of 668 laps; Pruett was at the wheel of the team's Telmex/Target Lexus Riley Daytona Prototype when the car checkered 1:15.8 seconds faster than second-place Patrick Carpentier in the No.11 Citgo Samax Racing Pontiac Riley.